Trion has announced a new project called Atlas Reactor, a team-based, turn-based tactical combat game with echoes of XCOM and a cel-shaded visual style that's a bit reminiscent of Blizzard's Overwatch. It pits teams of uniquely-skilled "freelancers" against one another in battles of up to five-on-five in size, and, as MMORPG.com says, it also eliminates all the waiting around that plagues many other turn-based multiplayer games. 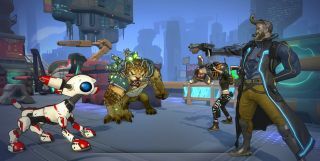 Each turn in Atlas Reactor gives players just 30 seconds to decide what to do, and each player makes his or her move simultaneously. This not only speeds things up, it also introduces a kind of "rock-paper-scissors" element, because players will have to make their move while trying to guess what the other side is going to do. Fog of war will be a factor as well, meaning you won't be able to see enemies, and thus make plans to deal with them, if they're hidden out of sight. Six freelancers have been revealed so far, including a cigar-chomping gun-runner, an armor-wearing behemoth, and a cybernetically-enhanced cat, each with a unique backstory and abilities, and at least two more appear set to be unveiled in the future. Matches are expected to run 10 to 20 minutes in length, and will support uneven teams—go one-on-five if you're feeling up to it—and solo play with bots. Atlas Reactor will be free to play, and is slated to come out in 2016. Find out more about the game and, if you like what you see, sign up for the upcoming alpha test at atlasreactorgame.com.